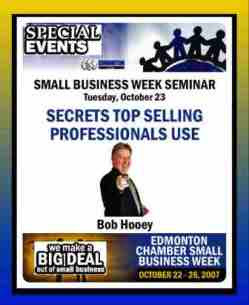 Had the opportunity to share a few secrets for Small Business Week to assist the Edmonton Chamber of Commerce. 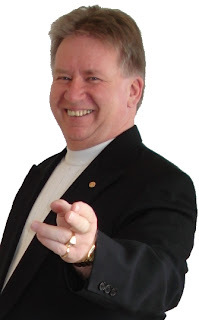 Shared Secrets Top Selling Professionals use to work smarter, make more money and have more fun in the selling game. Very interested crowd and we were able to unveal our new individual 'Sales Leaders' subscription to Secret Selling Tips. Looking forward to adding thousands of individual sales leaders to our Secret Selling Tips family over the next year. Visit: http://www.secretsellingtips.com/ for more information on how you can subscribe or sign up your entire sales team. Been very busy working on some new internet based projects. Two new websites as an extention of what we are doing with our http://www.albertaspeakers.com/ joint venture promotional project. Visit: http://www.edmontonspeakers.com/ and http://www.calgaryspeakers.com/ for more information. We will be expanding this service to speakers in other geographical areas across Canada in the future. Am also launching several destination based speaker websites for strategically targeted areas I would like to visit or work. Visit: http://www.novascotiaspeaker.com/, http://www.phoenixspeaker.com/, http://www.arizonaspeaker.net/ or http://www.lasvegasspeaker.net/ for more information. Recently, I had the opportunity to travel to Denver, CO at the invitation of the Canadian Consulate in that area. I was invited, along with 8 other technology firms from Alberta and Sask. to be a part of the CSIA annual DemoGala2007. 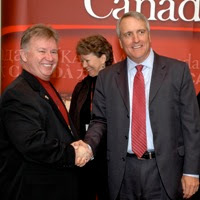 The Consulate staff brought CO Governor, Bill Ritter over to the Canada booth to meet us and to have his picture taken with the complete trade mission team after he finished speaking at the opening kick off. He had made a couple of major technology announcements and had been a good speaker. AS a speaker myself, I told him he had done a good job and encouraged him to keep up the good work... which brought a smile to his face. Someone told me later, that might have been due to his being new to the politician role since he took office in Jan of 2007. I hope he keeps close to who he is and shares honestly... we need more of that. News Flash: Oct 9-12: Denver, CO.
Canadian Trade Mission at CSIA's DemoGala2007 with 900 key technology professionals, government leaders, business leaders, venture capitalists, investment bankers and market influencers! 55 technology companies (inlcuding 9 Canadian) have been invited to display. CSIA theme is intensity, innovation and inspiration. We feel, as does the Canadian Trade Comissioner, that we are leveraging technology in this innovative and inspirational service to engage and equip sales teams. We have been invited to participate and display our innovative tecnology-supported "Secret Selling Tips," sales leaders success program. I am looking forward to meeting Colorado leaders who want to help their sales forces become more effective and profitable.